Hope you're enjoying the summer holidays. 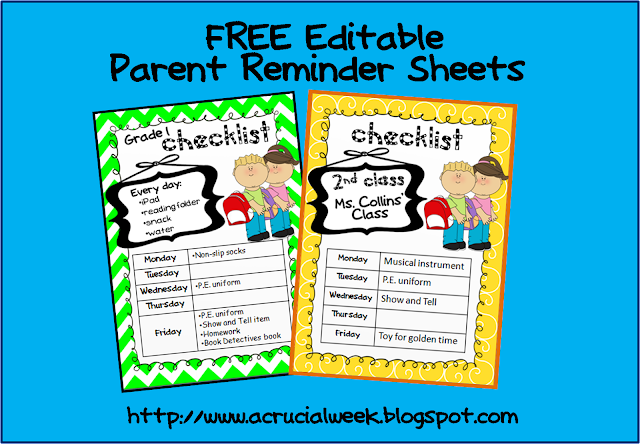 Here's a quick freebie - a set of editable parent reminder sheets. You could print them off and give them to the parents on the first week of school. However, if you've got a big class and don't want the printing costs, you could email them to the parents and they can decide to print it if they wish. I used one of these templates last year (see photo). The freebie includes two different styles in 6 different colours. You can download it for free from my TPT store by clicking here.